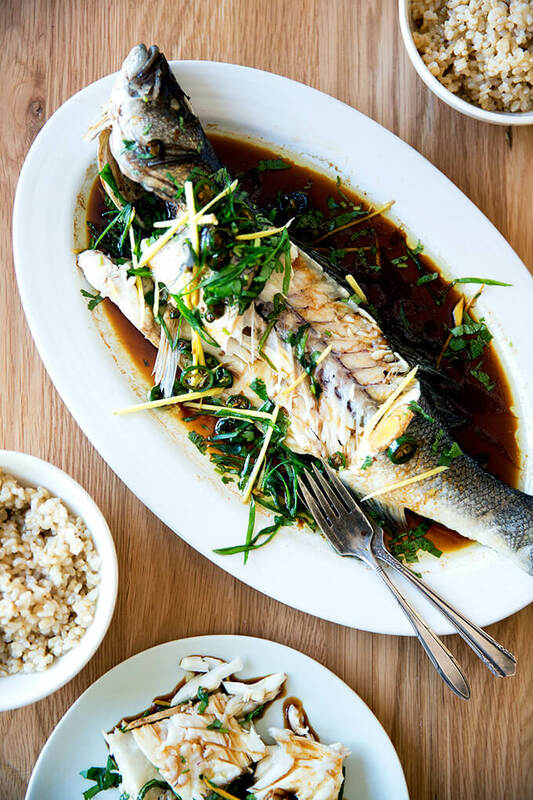 Whole fish, even for many fish lovers, can be a hard sell. The head, the tail, the fins — I suppose it’s just a little too much? 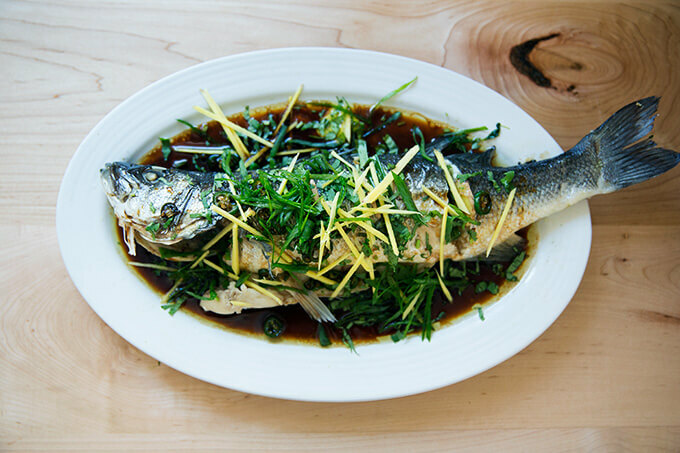 If this perhaps describes you, I’m hoping I can convince you to give whole-fish cooking a go, because I think you’ll fall in love with the method, this Chinese-style preparation in particular. 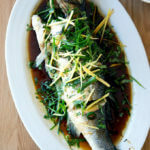 Steaming the fish — I’ve been using Branzino — on a bed of aromatics (ginger, scallions, and cilantro) with a splash of sake. 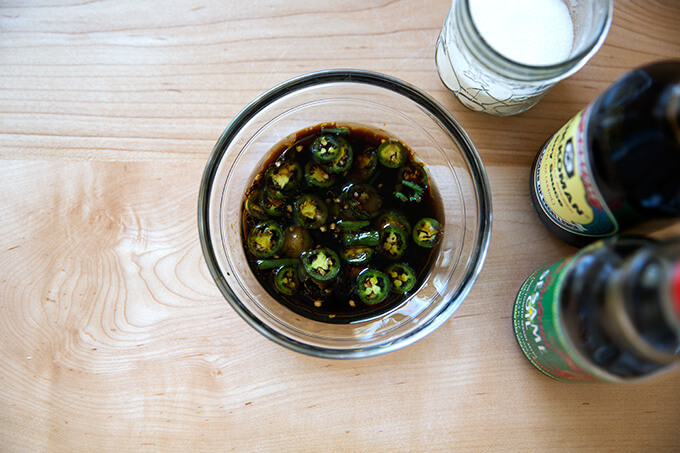 Making a sauce, a simple mixture of soy sauce, sesame oil, sugar and hot chilies (if you wish). Dressing the steamed fish with a few tablespoons of hot oil and the soy sauce mixture, which you heat up briefly as well. The sauce will sizzle upon meeting the steamed fish. 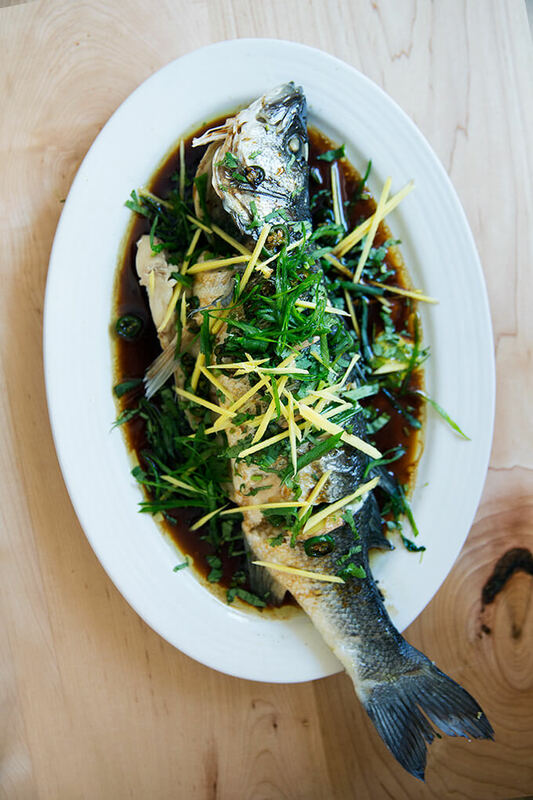 Showering the steamed fish with a final garnish of cilantro, scallions, and ginger. 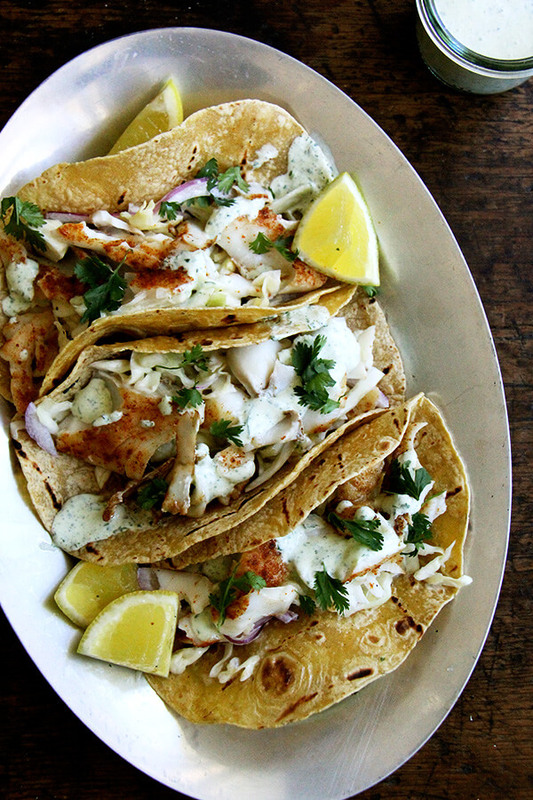 It’s really fun to make and truly one of the most delicious recipes for fish I have every made. As suggested, I’ve been serving it with rice, which tastes especially good with the sauce. Before opening Aloha Kitchen, I would never have thought to make this dish at home. 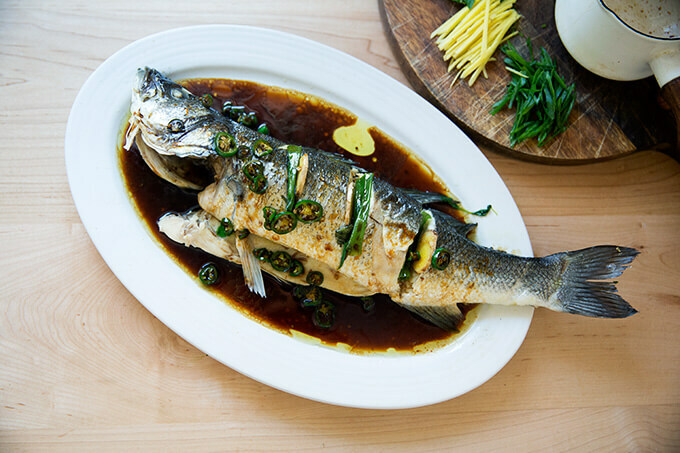 Steamed whole fish is something I often order out, because it’s consistently good. It’s also something I’ve always feared would never taste as good at home, one of those Chinese dishes that just tastes better, for whatever reason, in a restaurant. 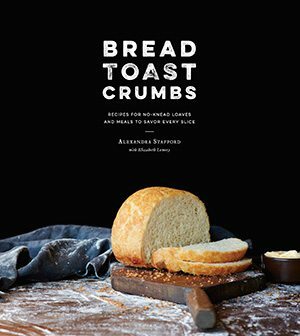 But Alana’s recipe has proven otherwise: it’s simple and delicious. I hope you give it a go. 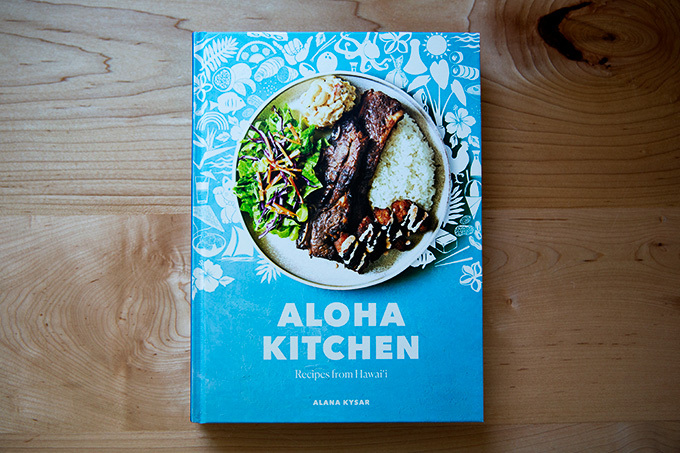 Incidentally, Aloha Kitchen is all about local Hawaiian food, which Alana describes as: “Creole cuisine built on the many influences of Hawai’i’s early immigrants.” These influencers include Hawaiians, Westerners, Chinese, Japanese, Portuguese, Koreans, and Filipinos. The foods of these various cultures are reflected in the recipes in Aloha Kitchen, all of which will make you want to jump on an airplane immediately, hightail it to the first drive-in in sight, and order a plate lunch of loco moco, steamed rice, and mac salad. Meet you there? Perfect. Can’t wait. OK, back to the whole fish. Heat retention. Like another favorite fish-cooking method, en papillote, the fish retains its heat. 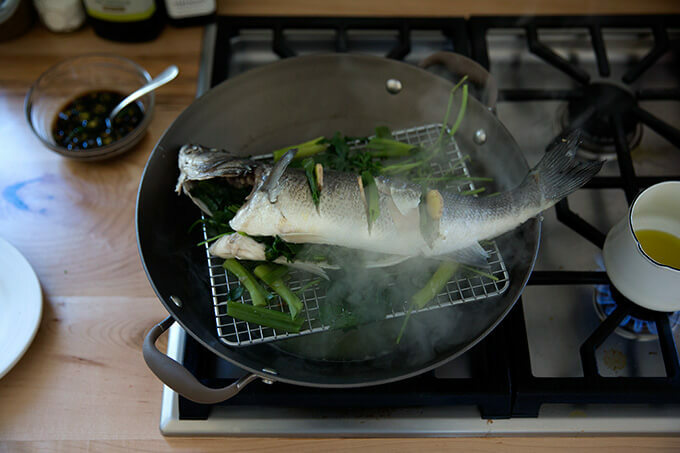 This method, which, as noted above, calls for pouring hot oil and sauce over the fish, gives the hot fish another blast of heat. Ease. Cooking filets of fish on a grill or stovetop takes a bit of finesse and there’s always the risk of sticking. 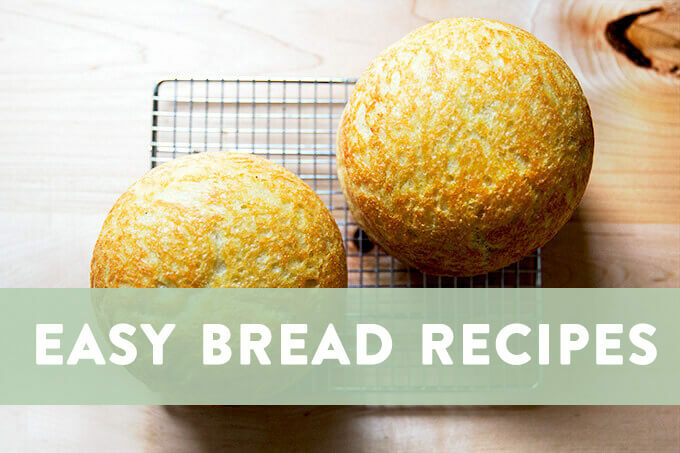 With steaming, there’s no such worry — no flipping, no sticking. Are you convinced? 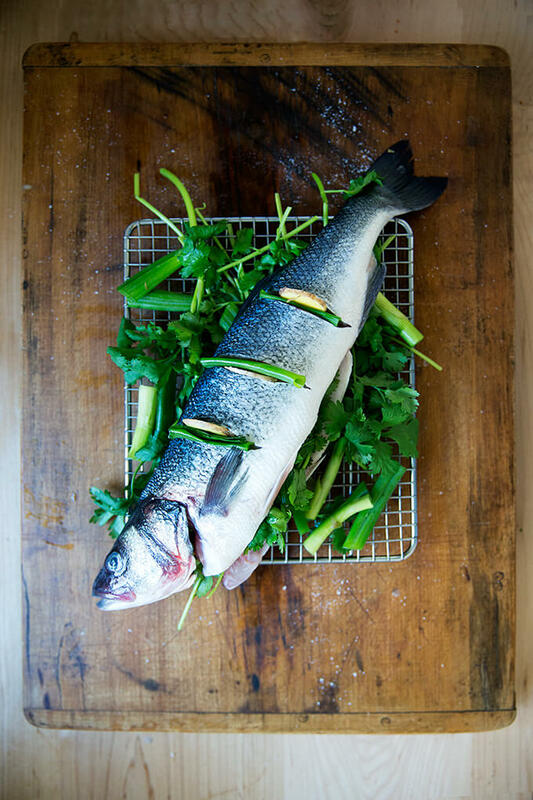 Will you give whole-fish cooking a go? Or are you already an adopter? 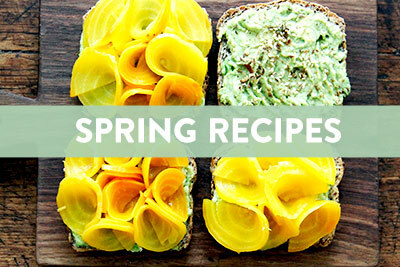 PS: ALL the Fish Recipes right here. 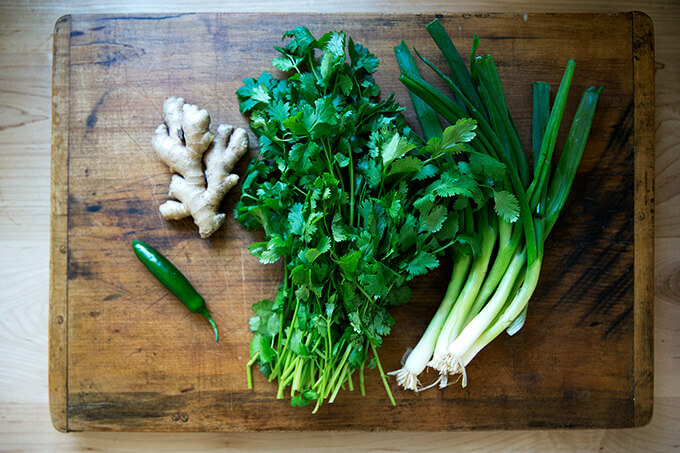 Here’s the play-by-play: Gather ginger, cilantro, scallions, and a hot chili, if you wish. 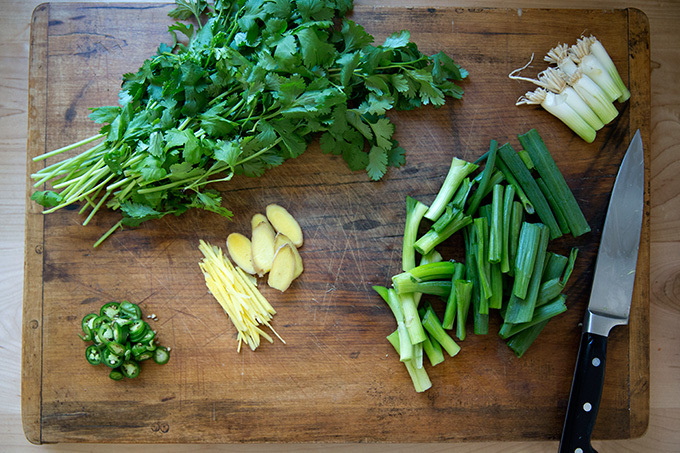 … and some finely for garnish. Stir together a simple sauce: soy sauce, sesame oil, sugar, hot chili. For this recipe, a mild, white-fleshed fish is nice. 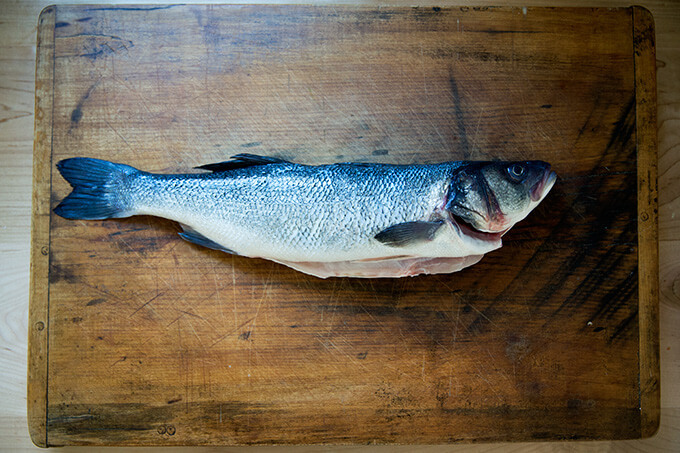 I’m using Branzino. 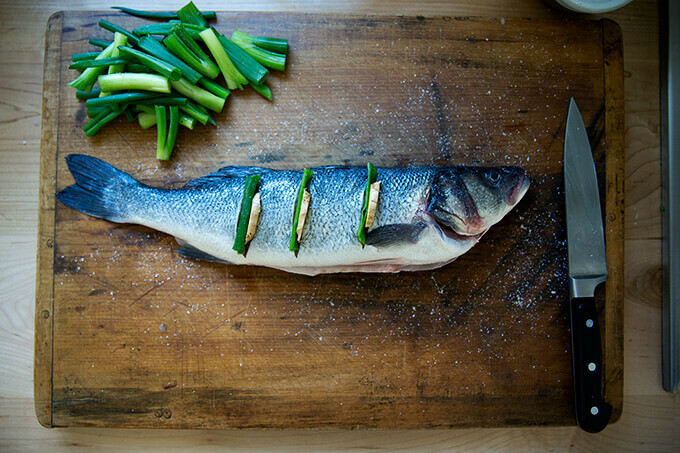 Make slits in the Branzino and stuff each with a coin of ginger and a slice of scallion. 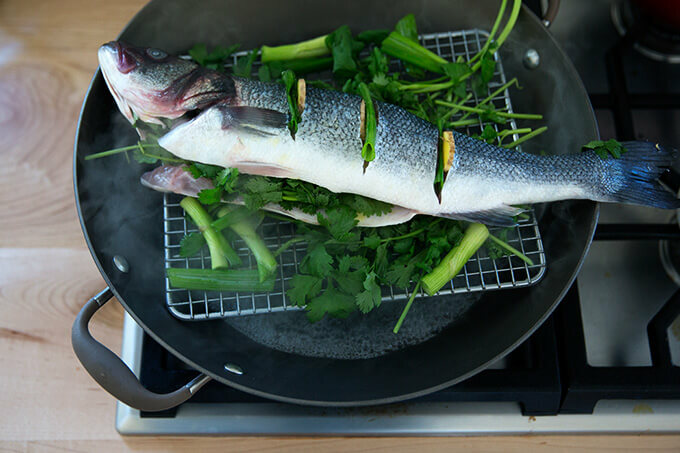 Prepare a steamer basket — I’m using a cooling rack — with cilantro, ginger, and scallions; lay the fish on top. 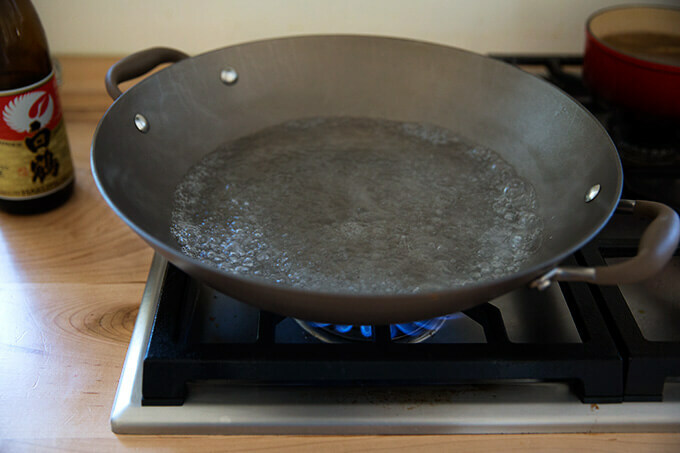 Bring water to boil in a wok or other wide vessel. 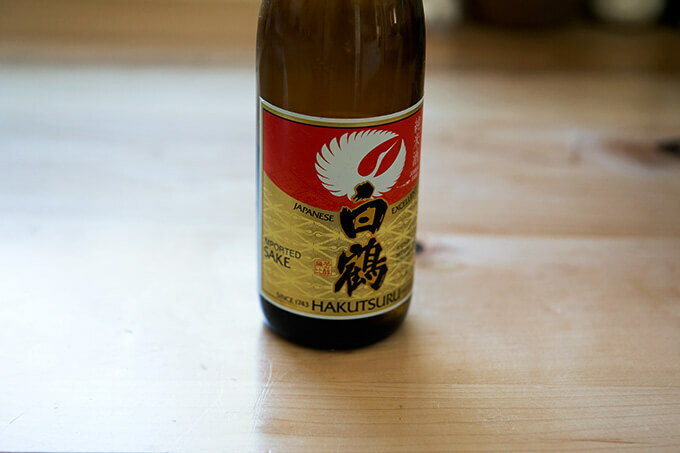 Pour 2 tablespoons of sake over top, then close the lid. Steam for about 10 minutes. Near the end of cooking, heat 2 tablespoons of olive oil in a small pot until it shimmers. Transfer fish to a platter, and pour the hot oil over top first. Heat the soy sauce mixture in the now empty pot, and pour that over top, too. 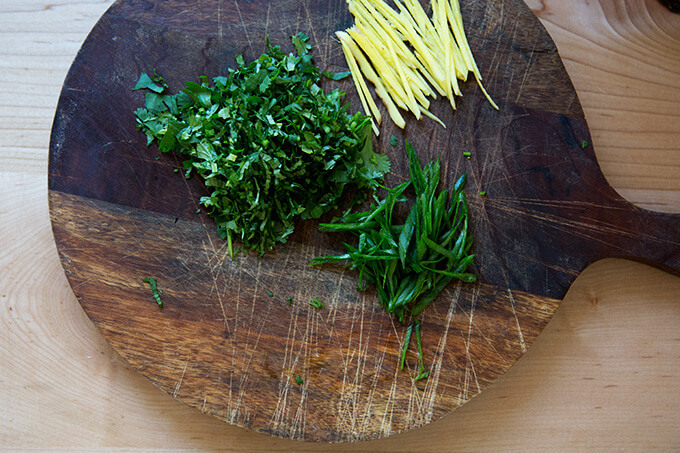 Garnish with slivered ginger and herbs. 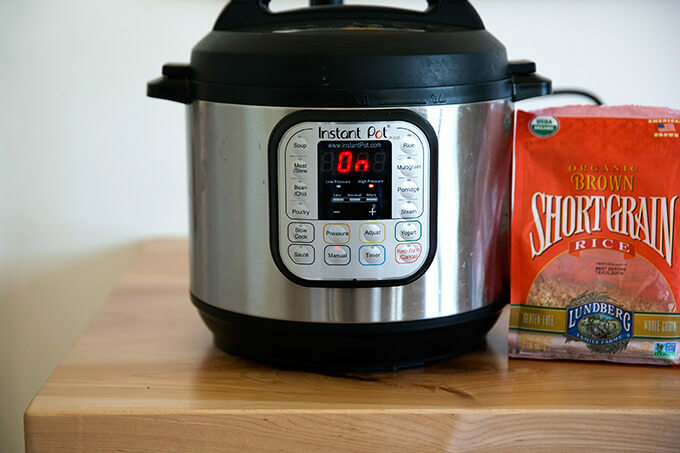 This is the recipe I use: Perfect Instant Pot Brown Rice. 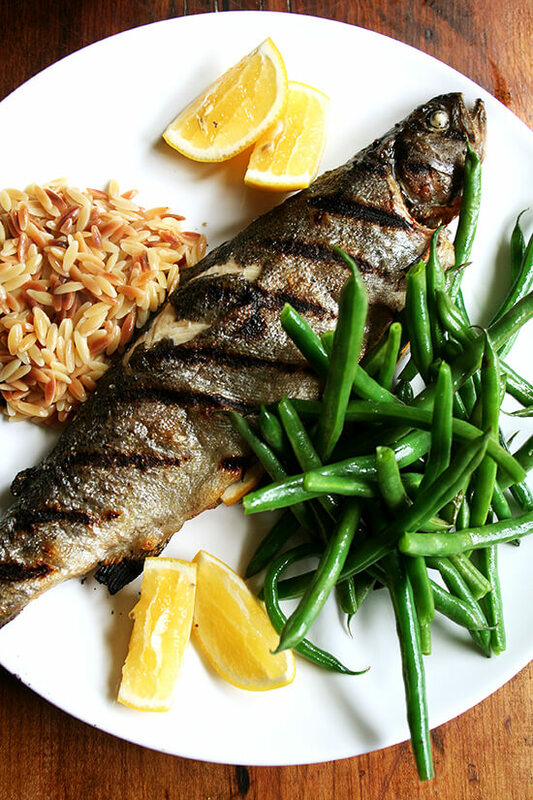 Whole Grilled Trout | Steamed Green Beans | Brown Butter Orzo "Risotto"
So happy to hear this, Linda! 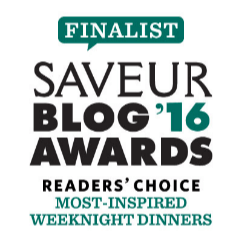 Heating the oil with the herbs sounds really delicious … I’ll try that next time, too 🙂 Thank you for the kind words. Why, oh why don’t I make whole fish more often? It is so easy, so, so much fresher, and dramatic than a boneless filet. Living near Rhode Island, I used local black sea bass, about a 1 1/2 pound fish. 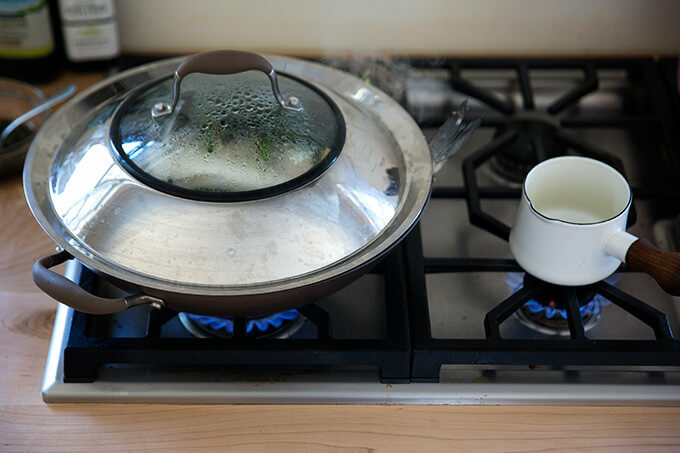 I used a 13 inch brasier with a domed lid and with a vegetable steamer (the little rod in the middle is a nuisance, but the height of the steamer basket is good). I added less water, enough to steam but making sure the water didn’t touch the fish. I had to snip part of the tail fin to make the fish fit. This sounds fussy, but really it took a minute to set up. 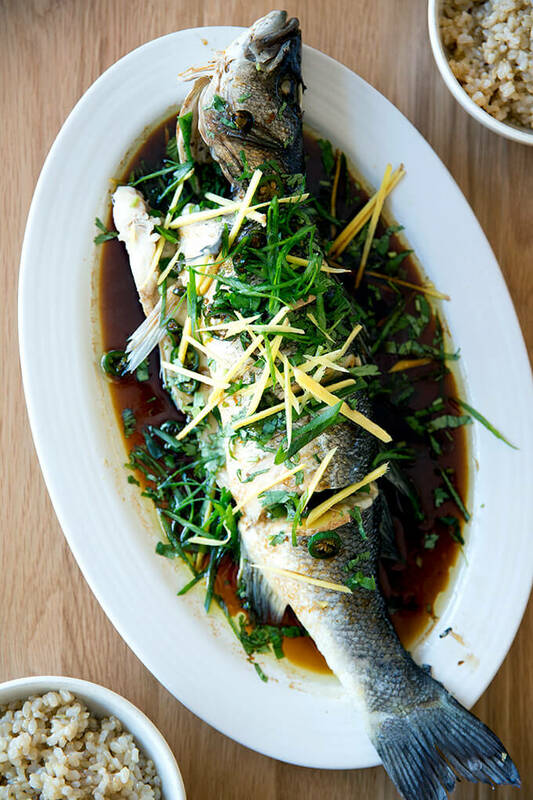 It’s amazing how the ginger, scallion greens, and cilantro infuse the fish with flavor. 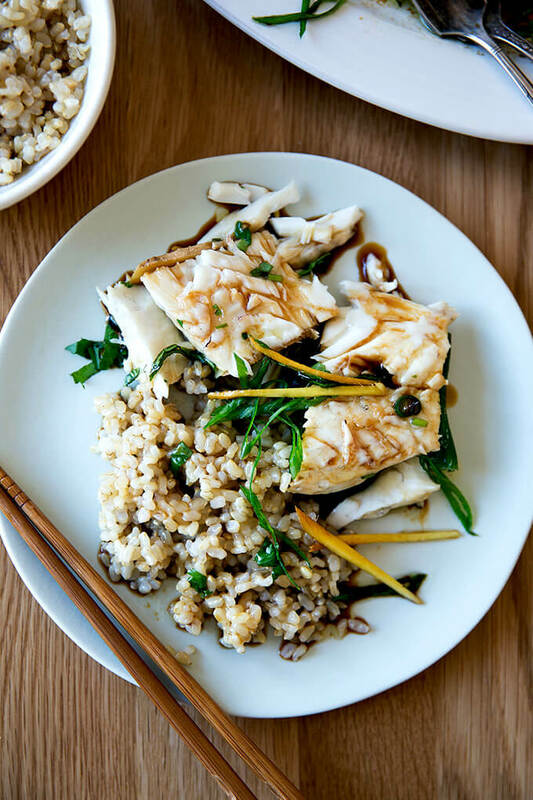 I stumbled upon macadamia nut oil at my health food store, and it’s well worth a splurge for this dish (and I also used it in Alexandra’s charred broccoli salad, which I served with the fish, minus the cheese if accompanying this fish.) I steamed the fish for 10 minutes, and it was perfect. Honestly, this fish is better than fish I’ve paid a fortune for at restaurants. 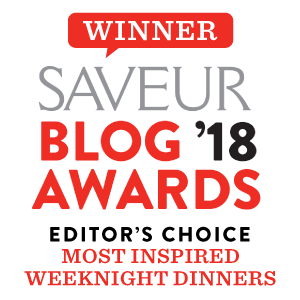 You might want to look at a video for serving a whole fish, but essentially, you cut with a sharp knife on the side of the fish and lengthwise and slide the fish off. Then, you lift the whole skeleton by gently lifting up the tail and pulling it forward. It comes off in one piece. I would suggest ordering your fish from the fishmonger so you have fish that hasn’t been sitting around. I hope your readers will try this. It’s fun to make and although it’s as easy as can, the process and results make you feel like a chef! So happy to hear this, Mary! I’ll look for macadamia nut oil. 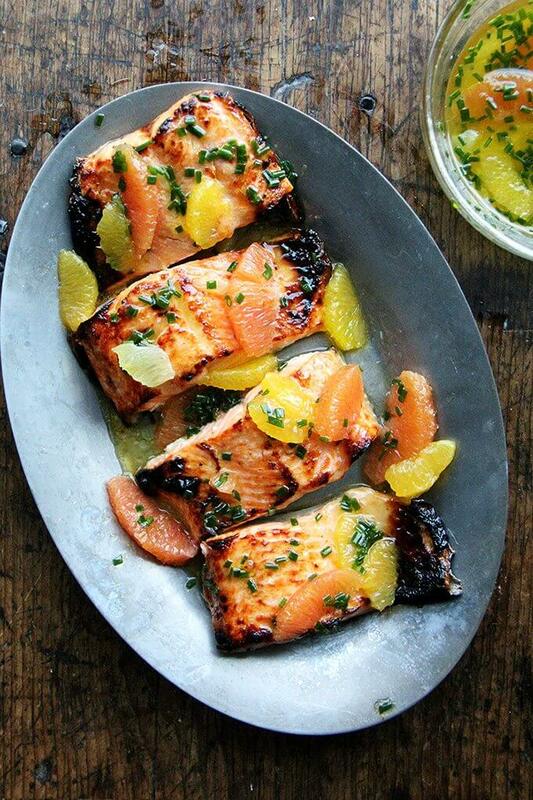 I find this to be one of the most delicious fish recipes I’ve ever eaten as well.